I love going out to eat, and I do quite a bit. It’s one of the perks of being a twenty-something-spoilt-rotten-gen-y-brat-with-a-disposable-income. 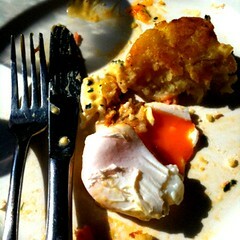 Lately I’ve been intriuged by what’s left on plates at the end of a meal. As a kid, mum would absolutely insist that I eat everything on my plate. These days Im not growing so much, and serving sizes kind of are. 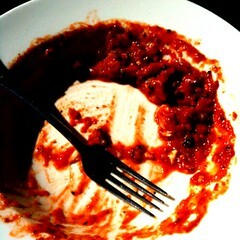 So I feel a little weird leaving stuff on the plate when Im done, especially when I’ve paid for it. There’s this little fight inside my brain; the parts of me that my mum made and my being cheap vs. the parts of me that aren’t hungry, backed up by the parts of me that value my being on the non side of fat. To cope with this very important internal conflict, I occasionally take a photo of my leftovers. An unforeseen bonus from this little slice of crazy is that I remember my meals and the venues better. Actually, the whole day falls out of my memory clearer , I don’t even need to be looking the photo. PS: Hey yay! Im writing in my blog! What the hell? Friend of mine said she’d link to me if I updated regular like. I promise to try.